Ladies, it’s time to embrace your inner dance mom, because we’re singing drill team praises today! It’s not just about kick lines, red lipstick, hairspray and sequins. It’s about teamwork, a sense of accomplishment and structure. In Texas, drill teams are like sororities. These young women are more like tight-knit families than friends. They dedicate themselves to their craft and bettering the community. There are legacies and alumni spanning the generations. 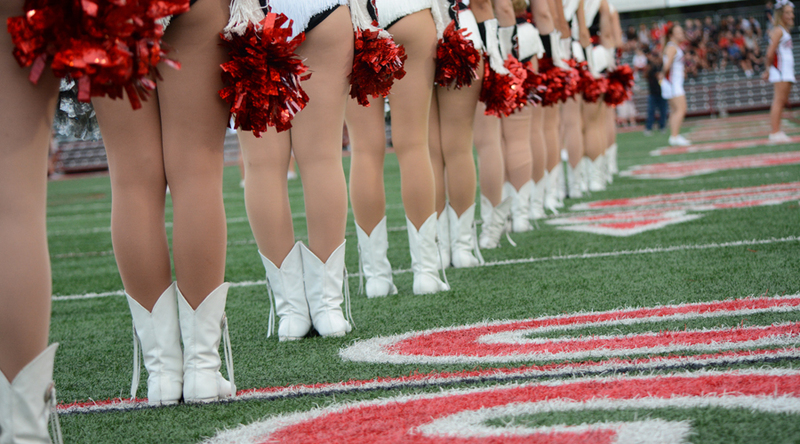 This weekend, two Lake Travis area schools will be having their annual Spring Shows, the Vandegrift Legacies and the Lake Travis Cavalettes. In honor of these talented young ladies and everyone who supports them, we’re taking a closer look at the Cavalettes (founded in 1981) and the Legacies (founded in 2009). Plus, we’ve added a little tribute to former drill team members who are still cultivating a love of dance in the Lake Travis community. Just like our football teams, our local drill teams consistently make headlines for achievements and awards. For example, Sarah Clemmons, a Lake Travis High School senior and captain of the Cavalettes dance performed at the President’s Gala in January 2017. She was one of the 25 dancers selected by the Texas Dance Educator’s Association to perform. Just recently, the Vandegrift Legacies (along with Viper Band and Vision Dance Company) participated in Honolulu as part of an ongoing commemoration of the 75th anniversary of the December 7, 1941, attack on Pearl Harbor. In 2012, Ashley Bonner, assistant director of the Legacies, performed at the 70th Pearl Harbor Commemoration Event as a member of the Kilgore College Rangerettes. Over the years, both drill teams have performed at stadiums throughout Texas and participated in parades and special events nationwide. Both drill teams have walked in the annual Thanksgiving Day Parades in New York and Chicago. The Cavalettes have participated in the 123rd Tournament of Roses Parade in Pasadena California and they’ve opened for the Radio City Rockettes at Bass Concert Hall. They have those eye-high kicks in common! Known as the first drill team in the world, the Kilgore College Rangerettes set the standard for drill teams back in 1940. Think of them as the Coco Chanel of dance. What are the hallmarks of a drill team? Tickets available online. Showtimes: Friday, April 28 at 7pm, Saturday, April 29 at 2pm and 7pm. This weekend, the Vandegrift High School Legacies Dance Team will present their Vanguard 2017 Spring Show, World Tour 8.0. Tickets available online. Showtimes: Friday, April 28 at 7pm, Saturday, April 29 at 1pm and 7pm. Both drill teams offer a variety of classes, workshops and summer camps for younger girls. It’s a great way to share the love of dance and support the teams in the process. Future Legacies and future Cavalettes will have a blast! Want to give a shout-out to a former drill team member giving back in the Lake Travis community or to your favorite dancer performing this weekend? Let us know on our Facebook page!